Whispers in the Loggia: Papstbruder... Witness? In a development eerily reminiscent of what 2002 unleashed on these shores, recent weeks have found the German church suddenly engulfed in a wave of allegations of sexual abuse going back decades, the revelations appearing to cast an ever-wider net. Sparked by a January report in Der Spiegel -- which chronicled the "systematic" abuse of close to 20 onetime students at an elite Berlin school run by the Jesuits -- the allegations currently number over 150, mostly from boarding schools operated by orders in the 1970s and '80s, with new complaints "surfacing almost daily." After the German bishops issued a "deeply shocked" apology at their winter meeting last month, the Deutschebench's president, Archbishop Robert Zollitsch of Freiburg and Breislau, is scheduled to meet with Benedict XVI on Friday and brief the pontiff on the crisis. Yet in the meanwhile, arguably the most personal locale of any abuse case to date for B16 has emerged as two allegations were lodged late last week by a former member of the Regensburger Domspatzen -- the famous boys' choir of the Bavarian cathedral led by the Pope's brother, Msgr Georg Ratzinger, from 1964-94. With the abuse of the one choir member said to have been committed by two clerics, the cases in question took place in or around 1958. According to a letter released by Bishop Gerhard Muller of Regensburg in the wake of the allegations, both of the cited clerics were subsequently removed from their posts and jailed on charges. For its part, the "innocence of Georg" was affirmed by the Holy See, as was its intent for "full clarity" on the cases. In a statement run in Sunday's L'Osservatore Romano and reported on by Catholic News Service, the Vatican backed up Muller's push for openness, saying that cases needed to be examined "with decisiveness and openness" and that the church's primary interest was "to render justice to the victims." Along these lines, the same Repubblica piece that featured Msgr Georg Ratzinger's response saw the Roman Curia's second-ranking German prelate saying "enough" and calling for a "serious housecleaning" in the church. Soon to retire as president of the Pontifical Council for Promoting Christian Unity, Cardinal Walter Kasper termed the revealed abuses "execrable and unpardonable," saying that they must be "pursued with absolute firmness." The escalating German reports were just one aspect of a particularly difficult news-week for the Vatican; abuse claims by the dozens began to emerge in the Netherlands following press coverage of decades-old misconduct at a religious school there, and a stunning story unfolded behind the walls as a Gentleman of His Holiness -- the Vatican corps of distinguished laymen who serve as ushers at papal liturgies and in the Pope's Apartment -- was dismissed from his post after his involvement was uncovered "in what prosecutors believe was an organized network of gay prostitution," one that reportedly included the procurement of seminarians for the married gentleman-usher. As the Italian vaticanista Paolo Rodari put it late in the week, the developments made for "Caos Vaticano" -- "Chaos in the Vatican." 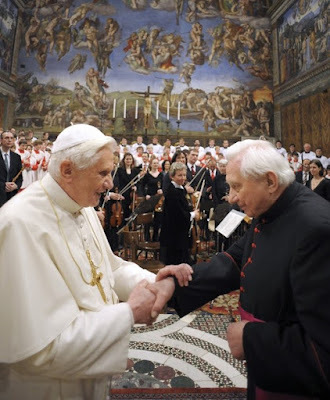 SVILUPPO: Catholic News Service reports that, in comments run on Tuesday, 9 March, in a German paper, Msgr Ratzinger said that, though he "had no idea that molestation was taking place... I'm deeply sorry for anyone whose spiritual or physical integrity was injured by abuse. "Today, such things are condemned even more because of greater sensitivities," the retired choirmaster told the Neue Passauer Presse, adding that "I also condemn them, and simultaneously ask pardon from the victims."